Adult and two nestling Eastern Imperial Eagles (Aquila heliaca), eas- tern Slovakia, 5 July 1974. There are about 30 to 35 pairs of this highly endangered species in Slovakia. See also Svehlik & Meyburg (1979). Meyburg, B.-U. (1986): Threatened and Near-threatened Diurnal Birds of Prey of the World. Birds of Prey Bull. Nº 3: 1-12. Meyburg, B.-U. 1987. 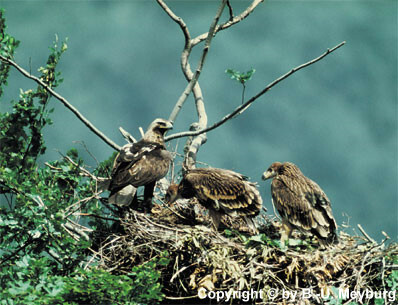 Cluch size, nestling aggression and breeding success of the Spanish Imperial Eagle. Brit. Birds 80: 308-320. Meyburg, B.-U. & C. Meyburg (1987): Der Fischadler (Pandion haliaetus) als Brutvogel in Mitteleuropa. Sber. Ges. Naturf. Freunde Berlin (N.F.) 27: 34-41. (Engl. summary: The Osprey as a breeding bird in Central Europe). Meyburg, B.-U. & C. Meyburg (1987): Present status of Diurnal Birds of Prey (Falconiformes) in various countries bordering the Mediterranean. Pp. 147-152 in: Baccetti, N. & M. Spagnesi eds. Rapaci Mediterranei, III. Suppl. Ric. Biol. Selvaggina XII. Thiollay, J.-M. & B.-U. Meyburg (1988): Forest Fragmentation and the Conservation of Raptors: A Survey on the Island of Java. Biol. Conserv. 44: 229-250. Meyburg, B.-U. (1988): Die 3. Weltkonferenz über Greifvögel und Eulen in Israel 1987. Vogelwelt 109: 183-185. Meyburg, B.-U. & C. Meyburg (1988): Der Schreiadler (Aquila pomarina) als Hochgebirgsjäger im Kaukasus.(Engl. 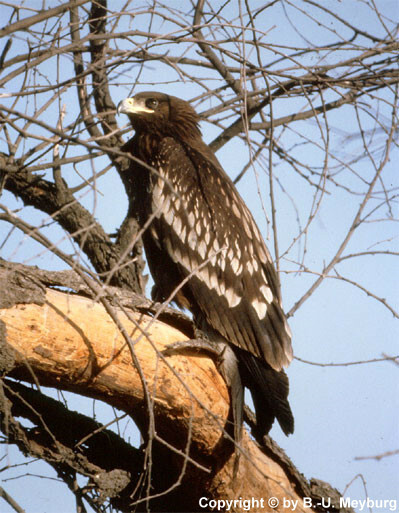 summary: Lesser Spotted Eagle as an alpine hunter in the Caucasus). J.Orn. 129: 102-103. Meyburg, B.-U. (1988): S.O.S. Mönchsgeier. Naturschutz heute 20 (Heft 2): 46-48. Meyburg, B.-U.1989. The Spanish Imperial Eagle Aquila (heliaca) adalberti: its Biology, Status and Conservation. Pp. 255-268 in: Meyburg, B.-U. & R. D. Chancellor (eds. ): Raptors in the Modern World. WWGBP: Berlin, London & Paris. Langrand, O. & B.-U. Meyburg 1989. Range, Status and Biology of the Madagascar Sea Eagle Haliaeetus vociferoides. Pp. 269-278 in: Meyburg, B.-U. & R. D. Chancellor (eds. ): Raptors in the Modern World. WWGBP: Berlin, London & Paris. Meyburg, B.-U., S. van Balen, J.-M. Thiollay & R.D. Chancellor 1989. Observations on the Endangered Java Hawk Eagle Spizaetus bartelsi . Pp. 279-299 in: Meyburg, B.-U. & R. D. Chancellor (eds. ): Raptors in the Modern World. WWGBP: Berlin, London & Paris. Meyburg, B.-U. 1989. Wild Status of Old World Vulture Species. Pp. 626-631 in American Association of Zool. Parks and Aquariums Regional Conf. Proc. Meyburg, B.-U. 1989. Raptors in eastern Europe: the probable impact of political changes on their populations, their conservation and on research. The Raptor 18: 8-13. Meyburg, B.-U. 1989. Weltweite Schutzstrategien für bedrohte Greifvögel.(Engl. summary: Conservation strategies worldwide for endangered birds of prey). Laufener Seminarbeitr. 1/89: 67-104 (Akad. Natursch. Landschaftspfl. (ANL)- Laufen/Salzach). Meyburg, B.-U. 1989. Der Affenadler. Schutzprogramm für den Philippinenadler. Naturschutz heute 21 (Heft 4.5): 62-63. Meyburg, B.-U. 1990. Winds of Change. The Eyas 13 (Nº 1): 10-14. Meyburg, B.-U. 1990. Les Rapaces de l'ex République Démocratique Allemande. Fonds d'Intervention pour les Rapaces. Nº 18: 12-14.
juv. Graeter Spotted Eagle Aquila clanga wintering in India.